This set of windows are for bathroom fanlights for the same house (as my last post) in Oxfordshire. The shape of the windows, the function of the rooms and the local landscape all led me to return to the River Thames for my subject matter. Although I had walked, photographed and drawn along the path of the river a couple of years ago, I hadn't found a good enough way to show the reeds along the river banks and the general stripiness of the flat landscape before. The photos of the windows installed, above and below, show the different colour of the light coming through windows and skylights in the bathrooms . The colours of the hand painted enamels are the same for each window, with the image of the blue river flowing to join the pictures together. I spent a long time on the design for these windows, struggling with my riverbank drawings. 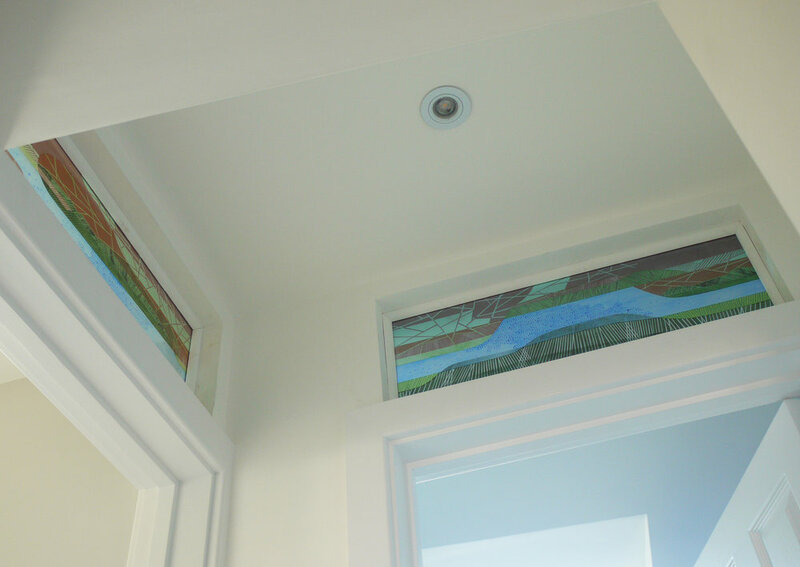 The designs look very similar to the finished windows, as is shown in the photo of glass on top of the drawing below. Back in my studio the drawings are still on the wall, giving me ideas for the next piece of work. Detail from window two: sample for window one on top of the sketch design. This house really needed new stained glass panels in its front door - the leaded lights continued to deteriorate (above) while I made the windows which were fitted earlier this month (below). The new windows do a good job of obscuring direct visibility on to the busy street, while letting patches of coloured light into the house which used to be a pub and brew house - hence the hops in my design. Hop windows, left from the inside, right from the outside. I really wanted the plant to look like hop, rather then grape, vines. I gave them particularly thin, twisty stems, small leaves and an extra firing of acid yellow on the hops themselves, which are actual size. Pictures taken on the lighbox during the making (below) show the play of painted patterned pieces from my scrapbox, and how the blocks move diagonally across the design. When the hop vines surround them, the coloured blocks are intertwined with a curvy pattern in green and sandblasted white. Details of the left hand panel (above) and the top right corner (below) show how the colours and textures change with the background to the window - obvious really. On the left the details are seen on a lightbox, on the right they have been installed in the front door and, as they should, look much better there with sparkling colours and highlights.